The type of stock market timing signals you use depends on what type of trader you are. 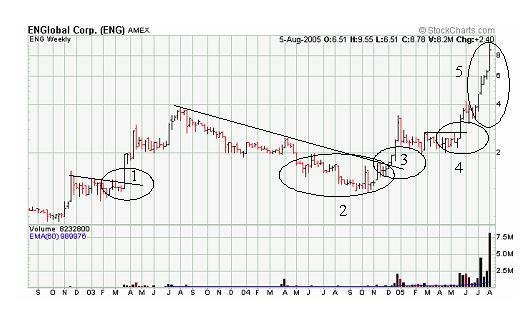 For example, let us look at five purchasing signals identified on the three year chart of ENGlobal Corp. (ENG) below. A momentum investor may purchase during this very quick rise. Provided you sold at the correct time, you could have made money in all of these trades as any of these types of stock traders. Some of the ways people time the stock market are by looking at the business cycle, using various trading signals such as number of new lows or new highs, by following timing indicators such as moving average crossovers or looking at chart patterns. You should also follow a tried and true saying, "The trend is your friend." Simply put, as a beginning trader, you should not acquire stocks in a downtrend. While many people believe that stock market timing is critical to their success as a trader, according to Van K. Tharp in Technical Analysis of Stocks and Commodities, April 1999, page 76 stock market timing only accounts for about three percent of your success.